Mani Ratnam’s latest film is a modern take on romance that works primarily due to the charisma and energy of the two main leads. Dulquer Salmaan and Nithya Menen breathe life into their respective roles as an ambitious game developer and an aspiring architect in Mumbai, and are helped along with excellent support from Prakash Raj and Leela Sampson. The romance is light and breezy for much of the first half, but the film falters a little in the second when events seem a little too contrived. 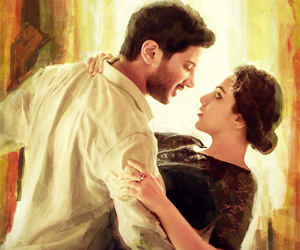 However the relationship is sweet and beautifully developed, the characters are engaging and the ‘feel good’ factor is high making OK Kanmani simply a very watchable romance that lets you leave the theatre with a smile. The film is set in Mumbai and Aadi (Dulquer Salmaan) immediately wins support for developing a new game set in Mumbai and made specifically with the denizens of that city in mind. I do like a good idea for the opening titles and OK Kanmani has an excellent start with the credits shown over an animation based on Aadi’s game. Aadi’s initial enthusiasm is a bit of a worry, but he soon settles down to show his zest for life balanced with genuine care and compassion when he moves in as a lodger with Ganapathy (Prakash Raj) and his wife Bhavani (Leela Samson). Initially Ganapathy allows Aadi to move in under sufferance and presents him with a confronting list of rules and conditions. However Ganapathy’s gruff exterior hides a softer heart and it’s not long before Aadi comes to respect Ganapathy and appreciate the love and tenderness he shows for his ailing wife. The relationship between Ganapathy and Bhavani is the central core of the film and becomes the yardstick against which Aadi and Tara (Nithya Menen), and ultimately the audience, measure the strength of their own relationship. Tara is working as an architect in Mumbai but has plans to attend university in Paris to further her training. Refreshingly she has no desire to get married, although she bases this on the failure of her parent’s marriage rather than anything more radical. However she has dreams and desires that are personal goals to achieve and she doesn’t base her worth on her marriage prospects. Aadi too has no desire to get married but does want a relationship with Tara, at least until she moves to Paris and he realises his dream of moving to the USA. Again, in contrast to most SI love stories, there is no stalking required here. Tara likes what she sees of Aadi and is happy to have a relationship with him until she leaves – no strings attached, just two people enjoying each other’s company. Mani Ratnam is careful to show that the relationship not a one-sided affair, and that Aadi and Tara have an equal attraction to each another. Both characters have reasons to act as they do, and the equal development of both the hero and the heroine is a welcome departure from many recent films with their expendable and interchangeable heroines. In addition, both Tara and Aadi have a fairly casual attitude to their romance and it’s fantastic to have a female character that isn’t afraid of declaring her desires just as loudly as her male counterpart, and act on them too. Aside from giving both characters equal voices in the romance, Mani Ratnam also perfectly captures the delight and excitement of the early stages of their affair; helped along by the excellent on-screen chemistry shared by the two actors. Aadi and Tara are independent and both are living away from their families, which gives them the freedom and opportunity to live as they please. They decide to move in together, and given the shortage of housing in Mumbai and the fact that Tara lives in a women’s hostel that means that they have to beard the lion in his den and face Ganapathy. However Ganapathy’s initial objections are overcome by the delight he sees on Bhanvani’s face when Tara sings with her, and as easily as that he agrees to the arrangement. Naturally Aadi’s brother and Tara’s mother are appalled when they learn of the relationship and find out that the couple are living together. The couple also have to deal with the looming separation as Aadi gets his chance to move to the States and Tara’s date to start University is finalised. Weaving through their struggles is the example set by Bhavani and Ganapathy – proof that perhaps love can be enough. Both Nithya Menen and Dulquer Salmaan are excellent and fit easily into their roles. Dulquer is a good fit for an enthusiastic but respectful young professional and there is no hint of the obsessive man-child more often seen in Indian romances. Nithya is perfect as the fiercely independent and strong-willed architect and provides a good partner for her co-star without straying into overly glamorous heroine territory. However Prakash Raj is the absolute star performer here and he easily steals the show every time he is on-screen. His facial expressions convey more than the dialogue and he has an easy rapport with Nithya and Dulquer while maintaining a perfect relationship with his onscreen wife. Leela Sampson is also superb and completely nails the quiet confusion required from her character while still maintaining her dignity. The scenes between Ganapathy and Bhavani are some of the most moving I’ve seen in recent times and are a good counterpart to the happiness and excitement of Tara and Aadi’s relationship. This second romance is what lifts the film above most love stories and compensates immensely for the somewhat disappointing end to the film. At least for me. Spoiler alert – stop now if you don’t want to know how the romance ends and skip down to after the next images. What is disappointing is that the film suggests that Aadi and Tara can only be faithful to each other and maintain their long distance relationship if they are married. I find the assumption that they would drift apart without that commitment a slap in the face for all the wonderful development of their romance that has gone before. I cannot see how marriage is the answer to their problem when they could have done exactly the same thing without getting married and probably had the same outcome – especially when the rest of the film does so well at banishing stereotypes and conventional attitudes. It’s a small point, but one that I found annoying given that it seemed so unnecessary – I have more faith and belief in the characters than it appears their creator does, although I did wonder if this was perhaps just a way to get past the censors given the live-in relationship portrayed – food for thought! Aside from my minor quibble about the end of the story, OK Kanmani is a beautiful romance that perfectly develops a balanced relationship and deals with many of the trials and tribulations of modern life for a young couple. The characters are believable, the situations generally realistic and the performances exemplary from the entire cast. Add in the upbeat and catchy soundtrack from A.R. 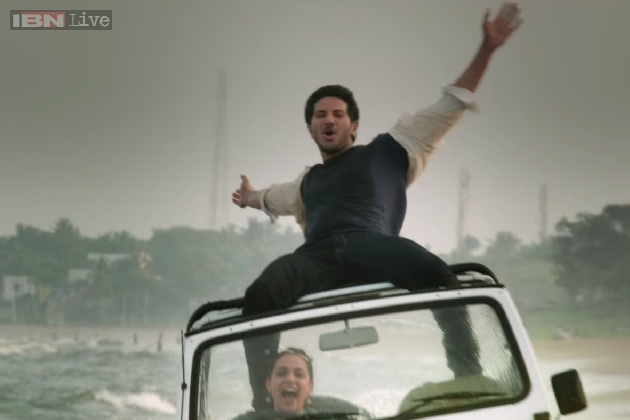 Rahman and O Kadhal Kanmani is definitely a film I recommend and one I will watch again and again. Just wonderful! This entry was posted in Kollywood and tagged A.R. 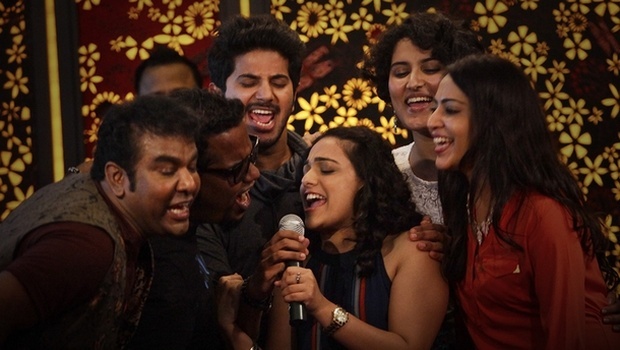 Rahman, Dulquer Salmaan, Leela Samson, Mani Ratnam, Nithya Menen, O Kadhal Kanmani, OK Kanmani, Prakash Raj. Bookmark the permalink. Definitely enjoyed the film myself, the review is pretty spot on. I wouldn’t quite say the ending was necessarily disappointing, I thought it was alright. The characters got into the relationship thinking that it wouldn’t last and realized by the end that they really wanted it to. I think Mani Ratnam was trying to portray a different, more modern view of a family structure, one that’s more flexible and balanced (how both characters pursue their interests but always come back to each other) and I saw it as more of a nod to the more conservative audience, as if the movie had ended differently, it might have had a different reaction. Glad to hear the movie is doing well. I think Mani Ratnam had mentioned in an interview that if you scratch the surface Indian kids remain quite conservative – I can confirm this is so with my young relos:) I thought the ending was a nod to that. PS: I absolutely adore your blog.The Tamil mythological posts are my favourite and I want to STEAL ALL THE SCREENCAPS. I’ve had a look at your blog too and you have some gorgeous pictures – so many beautiful costumes!